Rejoicing In My Posterity (or, the Personal Reflections of a 21st Century Grandma): Happy 4th of July! 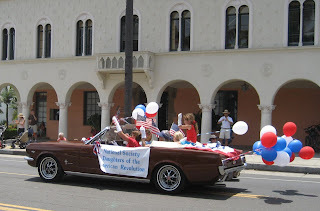 For the second year in a row, I have had the honor of riding in the Santa Barbara "Spirit of 76" 4th of July Parade down State Street representing the Mission Canyon Chapter of the Daughters of the American Revolution. Last year, we rode in a horse-drawn "school wagon." 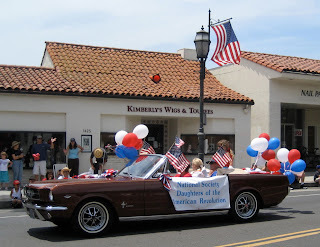 This year, we were hoping to have 2 decorated convertibles loaded with Daughters, with several younger girls walking ahead of the cars carrying our big banner . . . but it didn't work out quite that way. On the other hand, last year it cost each participant $40; this year we didn't wind up spending much of anything on what we DID have, and folks who came were very enthusiastic, so it turned out very well indeed. I thought I had about 10 folks who were going to participate, until the Gap Fire hit Goleta, and suddenly folks didn't dare leave their houses because of the poor air quality, or because they weren't sure they'd be able to get back home again if they came down to be in the parade, or because they had already evacuated! But, my #2 Vice Regent had a daughter, and a granddaughter, and a son-in-law with his own convertible who was willing to let us use it, and my dear friend, Marie-Louise, pointed me in the direction of a lovely woman who wanted to be in it with us, so in the end we had one classic car full of Daughters, and enough decorations to make a good presentation. Last year, we felt quite honored to be placed #6 in line; this year, we were #4!! But, I think 2 of the first 4 entries never showed, because we never saw anybody in front of us except some folks dressed in Revolutionary War costumes!!! What a fabulous (in my *humble* opinion!!) way to kick off an Independence Day parade!!! Dig out the Costumes, remind folks of the origin of the celebration, then show off some of the descendants of those who gave their lives to make it possible. Then, go ahead and show off the High School Marching Bands and the military helicopter and stuff . . . The little 6-year-old girl sitting on the back of the car was a HUGE HIT! AT first, it was hot, and she wasn't having much fun. But, when she saw her Great-Grandmother had come up to see her in the parade, and then started noticing some of her school friends in the crowd, she became a LOT more animated, and was smiling and waving to everyone, which really got the crowd cheering back for her! I'm hoping we'll get a pic in the DAR newsletter saying "3 generations in 1 car represent the Mission Canyon Chapter"
And everyone was SO CLOSE you could really talk to them! It's really amazing how "up close and personal" this parade is - - - more so than any other parade I've ever been in, and more so in the small car than last year in the school wagon. I was thanking one of the officers who was directing traffic, and he wandered over to the car and said, "I'm of German extraction, but my Wife has revolutionary war ancestry. 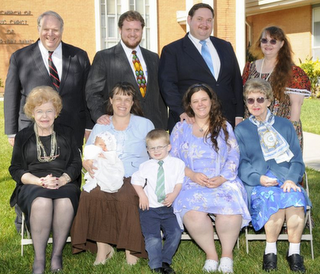 Boy, I can hardly WAIT for my daughter to join you guys!" It's a wonderful feeling, driving down a flag-lined street, with hundreds of people lining both sides of the road, many of them families with small children, lots of people waving flags, sharing greetings of "Happy Independence Day" or "Happy 4th of July!" To see the parents tell their little children that OUR great-grandfathers fought with Washington gives me hope that something of our noble heritage will be passed on to the next generation. And that's what the DAR and celebrations like Memorial Day and the 4th of July are all about.